Your system usually comes with two 1-way remotes that are already programmed and can keep up to 4 remotes in it's memory. 1. Press and hold the "f" button on the remote until the transmit LED lights solid approximately 10 seconds. 2. Press and hold the start button until the remote LED blinks three times, and the transmit LED lights up. 3. Enter the remote programming mode and choose the function for "auto learn configuration" listed on the program grid. 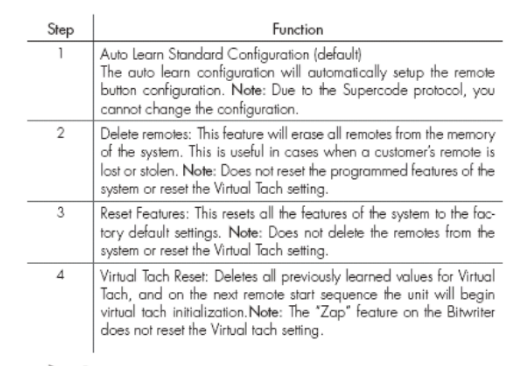 Once you're done with the setup mode on the remote, use the following instruction to add remote controls to the system. The program may also be locked if previously programmed using the Bitwriter. If the horn generates one long honk when attempting to program the unit, the learn routine is locked and must be unlocked using the bitwriter before proceeding. (Program mode on the receiver which has the Valet switch/button, plugged into the blue port, and used for programming). 1. Turn the ignition ON. The heavy gauge pink wire must be connected. 2. Within 10 seconds, press the program switch corresponding to the number of the desired function step listed in the following table. Once you have selected the function step, press the switch once more and hold it. The LED flashes and the horn honks to confirm the selected functional step. Do not release the Program switch. 3. Press the LOCK button on the remote. The horn honks to confirm that the code has been successfully programmed. 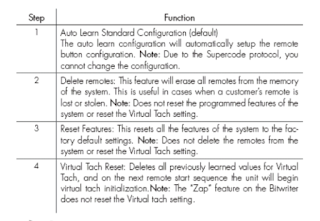 It is not possible to teach a remote button to the system more than once. 4. To advance from one function step to another by releasing the Valet/Program switch and tapping it to advance function steps and then holding it.